So if you’ve read any of my recent posts, you’ve probably figured out that I am a total eyeshadow addict. When I began to expand my makeup collection, it was probably months before I realized I could try new products that were not eyeshadow. As a result, I am actually scared to count the number of eyeshadow palettes I have. I honestly don’t want to know. Recently, though, I’ve begun to get really excited about foundation. I’ve always been a one foundation kind of girl–if I have one that works, why try another? (That actually hurts to say, just a little bit.) But that was my mentality. Problem is, the foundation didn’t always work, but I had no idea. I had nothing to compare it to. I just assumed that all foundations settled into fine lines, broke up around my nose and mouth, and looked splotchy by day’s end. That’s what foundations are supposed to do, right? Obviously not, but I just assumed they were problems I was going to have to live with. So recently I’ve begun to try our a bunch of foundations and I am surprised at how much I’ve enjoyed it, and how different they are. So far from the “if you’ve tried one you’ve tried them all” mentality I had not so long ago. I also better understand my skin type: somewhat dry, especially in the winter, and I rarely get oily except on my chin. And of course, I need to find something that won’t settle into fine lines, my biggest problem. I judge all foundations based on these needs. I tell you this so that if these are not your needs, you can decide if the products I’m recommending would work for you. 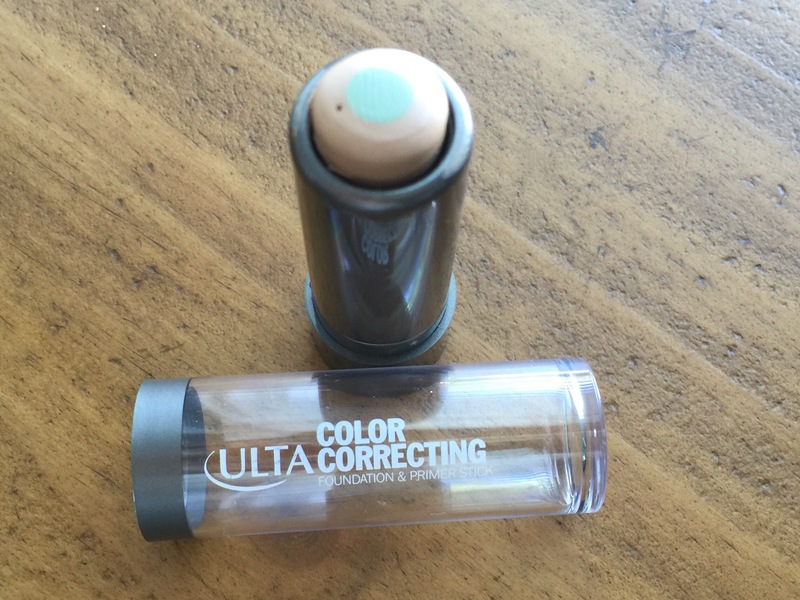 Today I’m going to review two of my newest purchases: the Ulta Beauty Demi-Matte Foundation and the Ulta Beauty Color Correcting Foundation Primer Stick. During the 21 Days of Beauty sale, these foundations are on sale on Wednesdays for $6, down from around $12.50 full price. The formula is exactly as Ulta describes it: It literally glides on your face and almost blends itself, it is so creamy. I used a buffer brush and it blended faster than any foundation I’ve tried. It has a medium-coverage, somewhat dewy finish, but it dries down so that it is not sticky throughout the day. I do set my T-zone, and because I’ve been testing a loose powder, I set my face as well. The foundation stayed put all day on my face and the finish was smooth and bright. It did wear off a bit around my chin the first time I wore it, but I came to realize that was the fault of the loose setting powder I was using. Every foundation I’d worn with that powder broke up on me, even when they hadn’t before. Sure enough, when I tried it again with different setting powders, the wear time was fantastic. (So I do not recommend Almay’s Smart Shade Loose Powder, in case you’re wondering.) The finish is just so natural and pretty, and because the stick includes foundation and primer that saved me a step. (Well, okay, I don’t often wear primer, but now I just didn’t wonder if I should have.) The great thing about a stick foundation is that it’s very easy to take with you for touchups, so even if it does wear in spots that is not a total deal-breaker for me. I am excited to keep using it, which in my book means it was a success! I think it would be great for you if you have dry skin and want medium coverage. If you have a lot of redness or scarring, I would highly recommend it–it cancels out redness beautifully without the need for a lot of extra product. It could also work as a spot concealer over another foundation if you wanted to conceal any acne spots, though I would recommend setting it with powder. If you have oily skin, I would probably stay away from this one. Because it already has a dewy finish, it will not mattify and will likely get shinier throughout the day. But don’t despair–the next foundation I tried might be perfect for you. Another thing to remember: Stick foundations generally contain far less product than traditional liquid foundations. 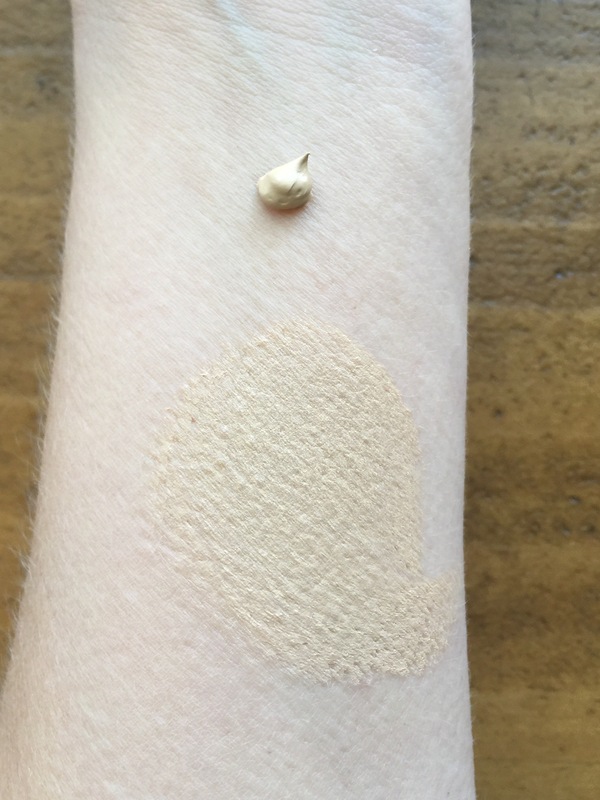 Most liquid foundations give you one fluid ounce, while stick foundations average 0.25 oz. Perhaps you use less product and they last just as long, or maybe you’ll need to repurchase more often, I just haven’t tried enough to know. For what it’s worth, I’ve worn this foundation a few times and swatched it a lot, and I don’t feel like I’ve made much of a dent. Because it is on par with other stick foundations as far as the amount you get, this is not an issue for me. 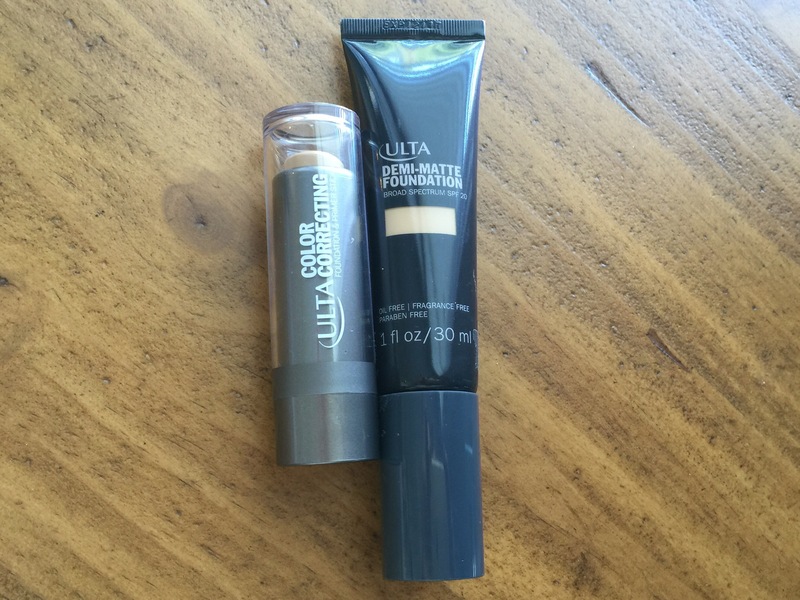 So next I tried Ulta’s Demi-Matte Foundation SPF 20. 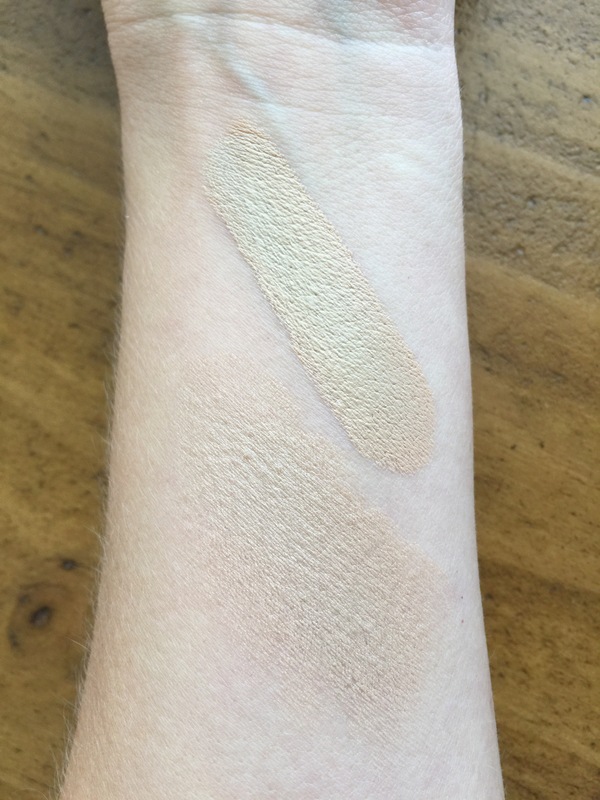 I had intended to try Ulta’s Double Duty Foundation, but when I swatched the color on my hand in store it was so thick! It felt like spackle or clay–I just couldn’t imagine how that would blend on my face. 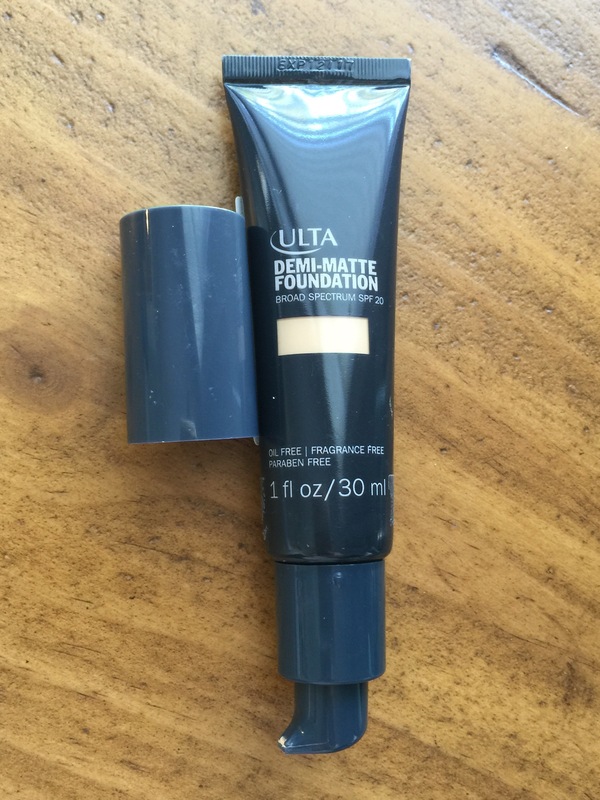 I’m not saying it’s a bad foundation–I haven’t tried it–but from my brief encounter in the store, I can say that I really didn’t want to, especially when just above it was a beautifully-packaged bottle of demi-matte foundation that caught my eye. This foundation claims to be a gel formula that “absorbs oil and prevents shine,” according to the bottle. It also says that it blurs the appearance of fine lines–oh please, please!–with “light diffusing pigments.” Oh no. I was afraid this would be yet another foundation that “blurred” by way of tiny glitter in the formula like Revlon’s PhotoReady Foundation, the aforementioned “broke up all over my face” foundation that is one of my only true makeup fails (yet I wore it for months without questioning whether it worked for me–yikes!). But I was so happy that I cannot see a trace of glitter in the Ulta foundation formula. Whew. So I feel like I am 2 for 2 in Ulta Beauty Foundations. I highly recommend both of these products. All of Ulta’s foundations will be on sale for the next two Wednesdays (September 14 thand 21st) if you want to check them out. I hope to see you back here for the next post in this series: Mascara!